There is one more fish that is worth to mention. A fish that should be on everybody’s bucket list heading to Anaa. I caught fish of this family already before and it is once more an epic experience. My number one fun fish. Without any serious competitor. I’m talking about the shark. 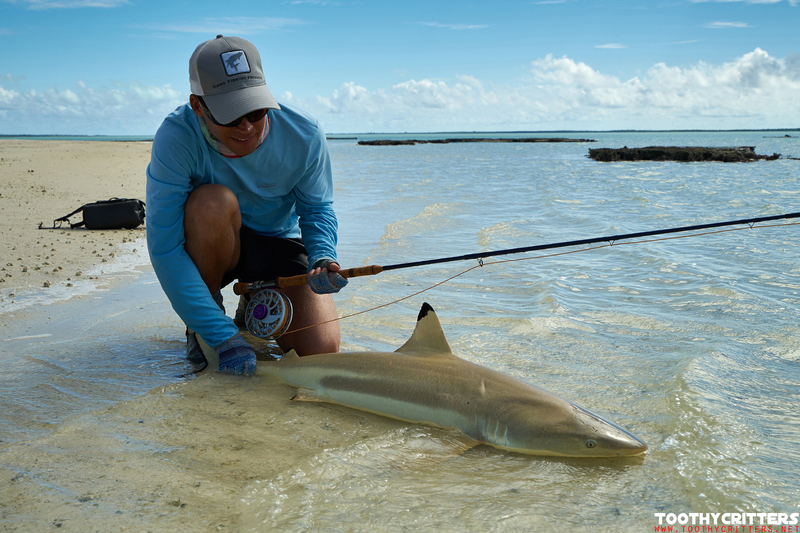 You might have seen the juvenile blacktip reef shark in the first part, a small shark I caught on a bonefish fly. But, this can be bigger…. much bigger! 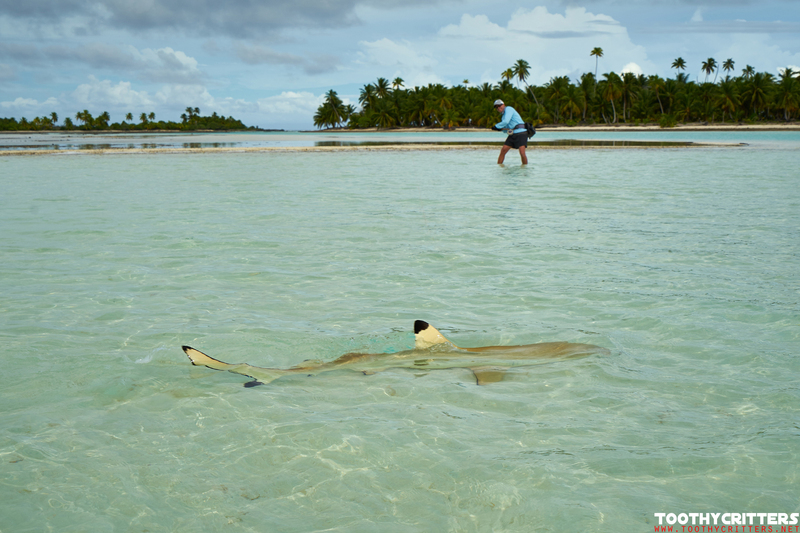 There are blacktip reef sharks in the lagoon of Anaa up to a length of 6 feet, maybe even longer. And there are plenty of those ones out there. For each fish on the flat there comes one shark. The life of a hooked bonefish must be hard. In general the conditions were also for the sharks not the best but more than enough to have some fun. The sheer number of them become visible once you hook a bonefish. Once the flat seemed to be empty before it fills up with sharks that search for a easy prey. 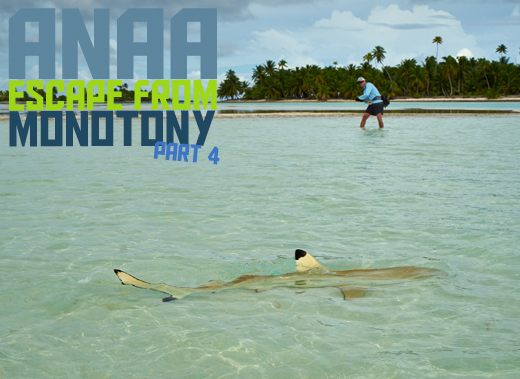 I heard from 20 sharks prowling around a hooked bonefish. If a hooked bonefish is not released immediately its all over. 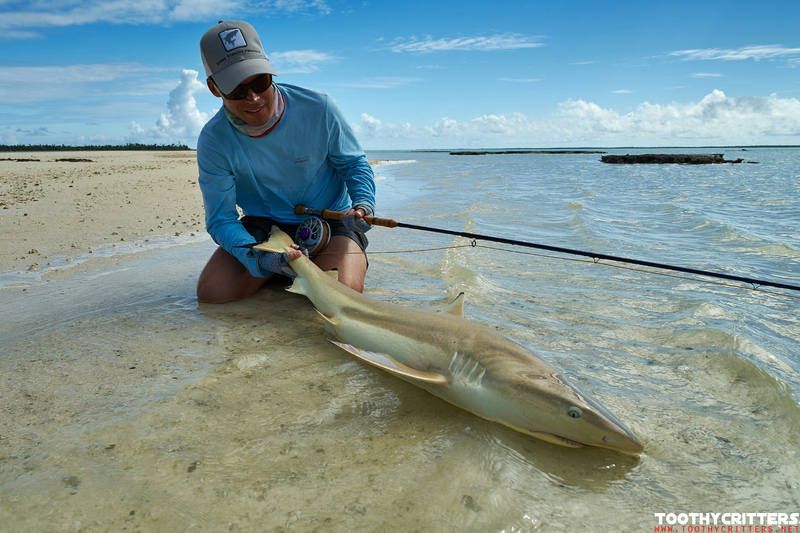 The sharks will chase the exhausted bonefish down. 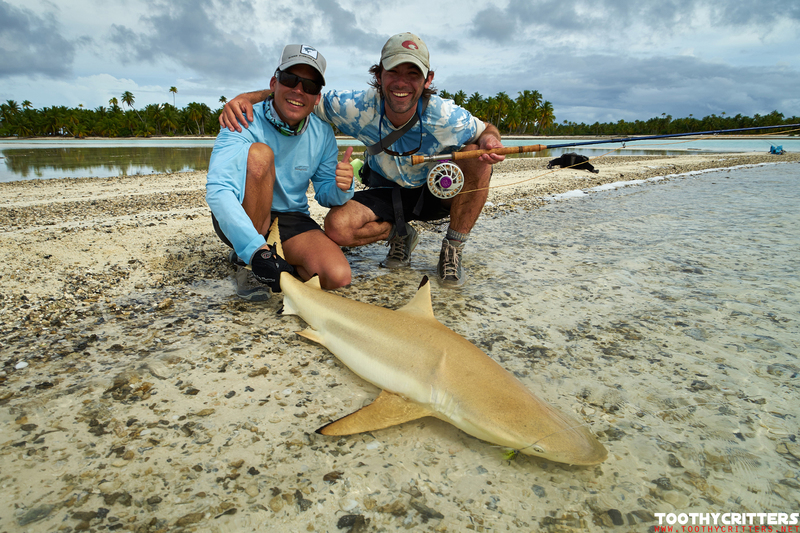 Sharks are not hard to catch and in the correct size an enormous hard fighting fish. I never left the boat without a second rod for sharks. 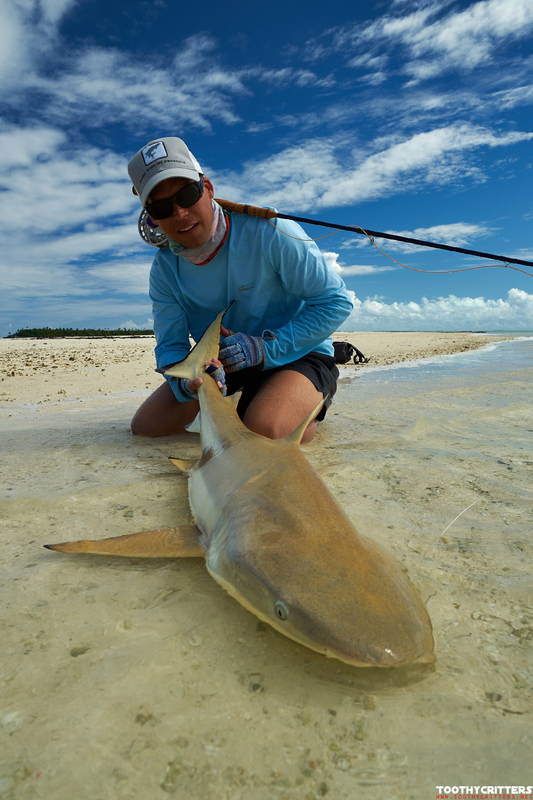 Unlike on Los Roques the sharks are really big on the flats. It is not uncommon to encounter sharks up to 6 feet long. That’s not a fish you can fight on a 8-weight bonefish rod. A shark that size pulls you 20 minutes over the flat. And this on a 12 weight rod. The fishing is pretty simple. The sharks can be spotted very easily with its dorsal fin out of the water. Even a beginner can spot those fish. All you need is to fire them up with big fluffy fly on a steel wire. Casting at them must be very precise because they can’t see objects far away. Further complication is that the fly does not send any electronic field like a wounded baitfish would do. They recognize their bait with their sensors. A fly is a dead object so you need to come across a shark that is a little more motivated! So.. If you have a fly close to them, lets say roughly a meter, start stripping slowly.! Either you get immediate response or not at all. They are fired up or bored. Sometimes they follow the fly to inspect what came across. Once they spot you its over. You won’t recognize that they spooked because they don’t show and simply ignore you. At least you get a perfect view of the fish you desire. Once they take the fly they go off like a rocket. Not as furious like a trevally or as fast as a bonefish but absolutely powerful and indestructible. 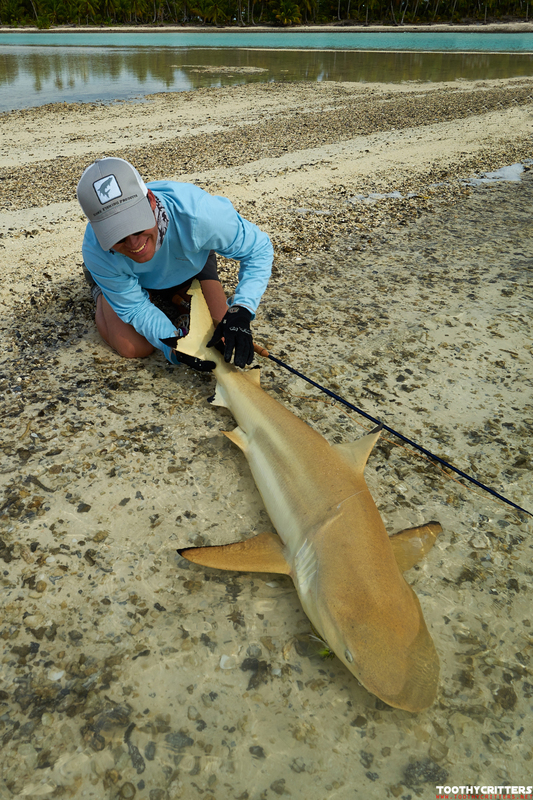 While a trevallies would be already bottom up a blacktip shark is still running on steroids. They fight incredibly long. Fight them as long as they are absolutely tired. It’s a big muscle with huge razor shark teeth. A muscle that can bite into his own tail in a blink of a second. 1000 miles away from the next hospital. No way to land them in the water not completely tired. Normaly I wouldn’t recommend tiring a fish but the sharks are an exception here. It doesn’t harm them. 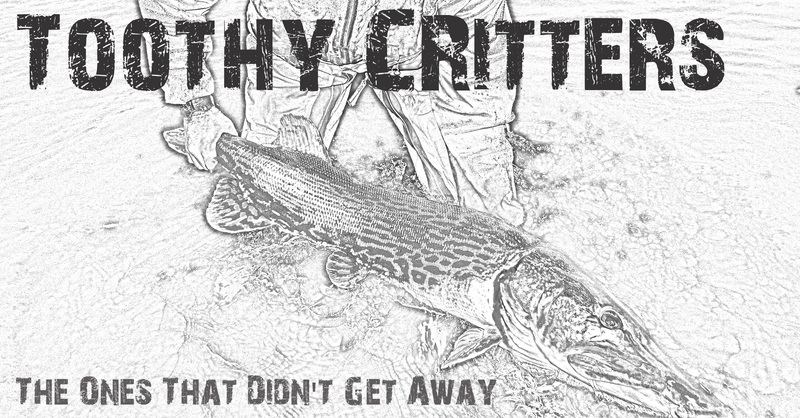 As a top predator at the end of the food chain nothing will chase and eat them. They can rest until they are fine. I tend to repeat myself but it is worth to mention. This is the most funniest fish to catch and they grow to sizes they aren’t just a consolation prize but much more a jackpot on the flats. Leader: 6-7 feet of 100 lbs fluorocarbon with 2 feet of 80lbs wire leader.